Are The Patriots Really Going To Win The Super Bowl? There are plenty of folks out there, that have already picked the New England Patriots to win Super Bowl XLV. I for one am not so sure about that, and even though it may seem like a done deal, there are a few pretty good reasons why this won’t be the Pat’s year to celebrate in North Texas. One of those reasons is consistency. The Patriots have been beaten pretty good a few times this year, and it shows, that they’re not as invincible as some would have you believe. The BetUS superbowl predictionfolks I think would agree with me. Their fans would argue of course, that good teams always find a way to win the big games, even if they play inconsistently throughout a season. I however disagree. I’m a firm believer in the mantra, that big NFL games are won on defense. Football is war, and it’s not just about scoring the big plays and points when you get the chance. It’s also about choking your opponents arsenal. 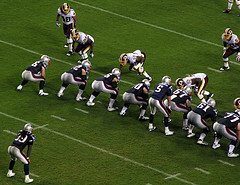 Keeping the other team at bay, not only makes things easier for your offensive unit, but can mentally demoralize your opponent on every level. Once a team get’s frustrated, they start to take chances, and usually end up losing big. The Patriots defense is an Achilles heel for the team. Their defense is currently ranked 30th overall. And, last but not least, some of the teams New England is likely to face down the line are simply more complete and balanced teams. The Ravens, Steelers and Jets are all more then capable of taking New England out of the playoffs. And, I believe one of them probably will. Help your child follow their ambitions by enrolling them in our exciting volleyball camps or basketball camps. Your child will find it fun and fulfilling to learn either of these sports. We take children off all ages. They do not have to be experience to enroll in any of the programs. No prior sports skill is required at all. All we need is a young person with the desire, we will take that desire and help turn it into athleticism. Our aim is to make sure your child is well versed in the fundamentals of the sport chosen. We seek to help create the passion and drive it takes to be an athlete. We want nothing but the best for your child and we will train them to be compete sportsman. Safety is the most important aspect of any of our sports programs. We know how important safety is ad we instruct the athletes to practice safety procedures at every practice session. Join our volleyball camp and get training from the experts. Whether your child is just starting out or not, our staff can help develop them right at the stage they are when they enroll. We well build on their already existing volleyball camps and give them an edge above competition, or we will build your child up at a consistent rate. You can expect safety, fun and knowledge of the sport from us. Basketball is a very popular sport. We teach young people the basics of this sport and more. 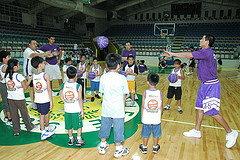 We do our part by teaching shooting skills, defensive skills and more basketball camps. Our emphasis is also placed on character building and actions that will benefit the player on and off the court. We enroll students of all ages. Check out our options today. Locate us online. We’re only a click away. Find the sports camps closest to you in a matter of seconds. Look under your state to find a complete listing. We look forward to getting started. Enroll your young athlete today.